This is the second part of my report on the Outsound Music Summit, focusing on the first two concerts. For those who missed it, the first part described the Touch the Gear Expo on the Sunday before the formal concerts began. The first concert, which was titled “Free Improvisation | Free Composition” began the way I often begin my own performances these days: with the ringing of a prayer bowl. This signified the start of Sacred Unit, the duo of Alicia Mangan on saxophones and the percussionist Spirit. Overall, this set consisted of free improvisation that blended avant-gard and more idiomatic jazz techniques with other folk and world traditions. I did find myself paying most attention to Spirit’s drumming and use of other elements for percussion, including his body and voice. The Rova Saxophone Quartet performed a new, set-length performance piece created especially for the Summit titled The Contours of the Glass Head. This is one of those pieces where it is difficult to tell where composition ends and improvisation begins. 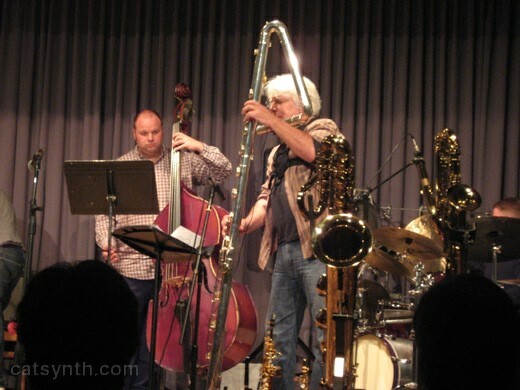 The group describes it as “the intersection of improvisation and composition, using improvisational games and strategies.” The members of the quartet demonstrated their powerful technical and musical skills as an ensemble and as four very strong players working together. At times one could focus on an individual solo or line from one performer, while at others the timbres and harmonies of the four saxophones seemed to act as one. As with some of the electronic performances the following night, there were sections of long drawn-out notes, and some very quiet subtle moments, which were interrupted by flurries of fast notes and punctuated phrases. Even if it was largely improvised, one could follow an imaged narrative to go along with the music. 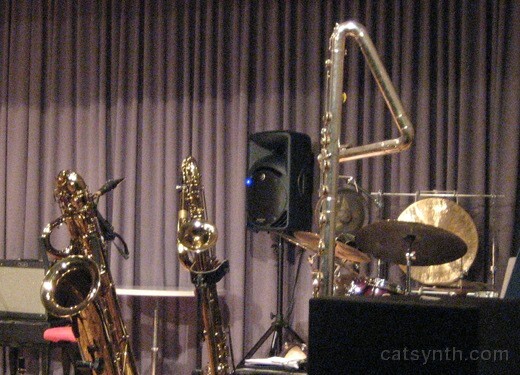 In this photo, we see a bass saxophone, a tubax, and a contrabass flute. These were all instruments used by Vinny Golia in the final set of the evening. Golia performed solo and group Compositions for Woodwinds together with Thollem Mcdonas (piano), Damon Smith (bass), Rent Romus (saxophone, electronics), Garth Powell (percussion), and Noah Philips (guitar). 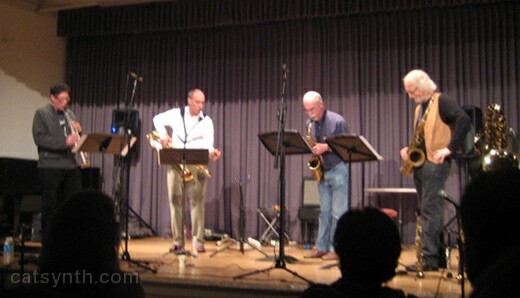 The lively and energetic performances centered on free jazz , with free improvisation and interaction among the performers, but showcasing the unique aspects of each musician and instrument. In addition to Golia’s virtuosic performance wind instruments large and small, I also noticed prepared piano sounds from Mcdonas, and hard driving guitar and percussion from Philips and Powel, respectively, and Smith’s ever present and versatile bass. The second program, “Industrial Soundscapes”, opened with Ferrara Brain Pan’s Form of Things Unknown. Long droning oscillators served as the foundation, on top of which he layered various shakers, bowls and other sounds, processed electronically. Ferrara Brain Pan is also an accomplished wind player, and incorporated bass clarinet into the set, which complemented the low-frequency oscillators. Sometimes they matched precisely, while other moments were as a counterpoint. Perhaps more than any of the other sets, this one matched my own current style of electronic music performance. Guitarist Peter Kolovos was introduced as having “surgical precision”. And it was an apt description. The staccato articulation of the guitar as well as the frequent changes of effects were very precise. There was never a moment where the sound was not changing, and changing quickly. At times it was quite loud and the effects quite heavy, but his dextrous performance was great to watch. Conure focused on analog and digital noise, with lots of distortion, feedback, delays and lo-fi effects. There were sections of steady-state noise, but what most stood out were the moments with interesting transitions and glitches. I realized that Conure and I had crossed paths at an Outsound event last year. 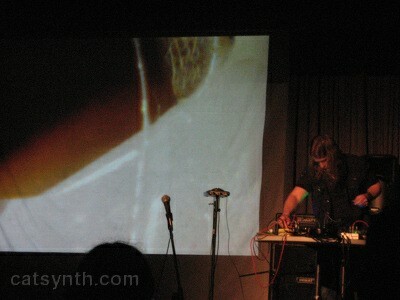 Hans Fjellestad presented Slimspor Cosmonau, a short video with improvised electronic sound accompaniment. I actually wasn’t sure whether or not the music was scored out precisely to match the film, but I was assured by the artist that was entirely improvised, which is possible if one is intimately familiar with the visual material. The film appears as a computer screen, with controls around a central video area depicting lunar and astronomical images as well as biological and anatomical scenes. Late in the piece, I recognized a distinctive squeak that I thought might be a Metasonix effects box, and inspecting his setup after the performance confirmed that he did have one of these infamous boxes. Indeed, Fjellestad’s performance featured an eclectic mix of analog instruments – fitting for creator of the 2004 documentary MOOG. 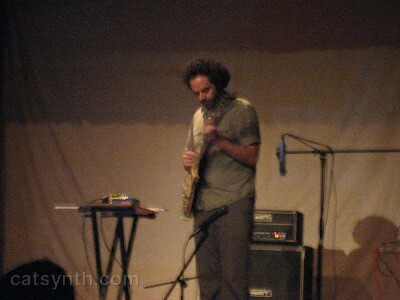 Thomas Dimuzio concluded the program with his complex electronics and timbrally rich and evolving soundscape. Dimuzio uses a variety of technologies, including live sampling and looping, feedback and modulated effects. The piece started quite simply with a relatively harmonic chord, and the overall effect was very calm but also metallic. Then a swell, and metal resonances. The overall motion of the set was very slow, a strong contrast to Kolovos’ set earlier in the evening. This is not to say that there weren’t discrete textures and details within the music, but it was more like the details one would focus on while examining a natural scene, or perhaps the industrial urban landscapes where I enjoy walking. With it’s gradual place and close, this was an apt conclusion to the “industrial soundscapes” evening.